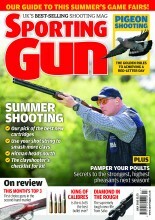 When clay shooting what makes a ‘no bird’? A referee will call no bird if either of the two targets breaks on leaving the trap, or in flight before a shot is taken. He will also call no bird if the clays flight path is clearly different to that of those thrown previously. If you break the first of an on-report double and the second is a no bird then the referee will say pair again, first bird established  in other words it will be marked down as a kill. This means that even if you miss the first bird in the repeat double the kill still counts: its the second bird you need to hit to complete the double. If you are shooting in a FITASC Sporting competition the same rule applies where on-report doubles are concerned but take care not to incur a penalty from the referee by not making a valid attempt to hit the first bird of the repeat pair. With no safety cage to restrain a shooter the course designer might present the second of an on report pair in such a way that you are forced to adopt a considerable change in stance to stand any chance of hitting the second target. In situations like this its tempting to position yourself for the second shot and ignore the first by mounting the gun, firing into thin air then dropping smoothly into place to deal with the second target. Some refs might turn a blind eye to your antics, but others might not be so lenient. Youve been warned!